It is not very often that a yacht like MITHRANDIR appears on the market. Built by the renowned Alden Yard in Portsmouth, RI, she represents the best of the best in construction quality, finish, and safety. The current owners have cruised her for over 100,000 miles spending much of their time in the South Pacific, but also voyages into Alaska, and throughout British Colombia. The addition of the hard dodger by the Franklin yard in New Zealand has added a whole measure of safety and comfort. She has been expertly maintained and up-graded along the way as the listing will detail. Sail handling is effortless from the protected cockpit in up to 30 knots of wind speed. She is a powerful cruiser that will take you wherever in the world you would like to go in comfort. MITHRANDIR represents a once in lifetime opportunity to start the journey of a lifetime at a bargain price. There is simply nothing like her on the market today that is “turn key” ready to voyage at this price point. Not for sale in Canadian waters. United Yacht Sales New Jersey would love to guide you through a personal showing of this 54' Alden Yachts 54 Center Cockpit 1992. 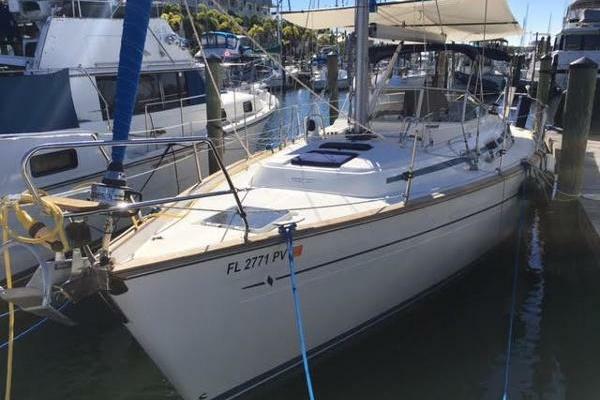 This yacht for sale is located in Seattle, Washington and priced at $395,000. For a showing please contact us by filling out the form on this page and we will get back to you shortly! Hydra & Hercules auto pilot. Primary auto pilot linked into B&G system includes cockpit pilot display and hand held controller (1999). Robertson AP2000DL auto pilot. Completely independent of primary auto pilot and 690 sailing instruments allows it to function as a true stand-alone back up steering system. Mastervolt Mass Combi 12/2500 sine wave inverter charger combination with generator support provides power to 120 volt ship system and 100 amp charging to 12 volt battery systems. A remote control and monitoring display is conveniently located aft of the electrical panel. Charger input 90-135 VAC 45 to 65 Hz, Output 12 VDC 100 amp. Inverter input 12VDC 200A, Output 120 VAC 50/60 Hz (2011). Mastervolt Mass 12/80 and Mastervolt Mass 12/60 battery chargers. Input 230V or 117V 50-60 Hz. Output 12VDC 80A/60A. Mastervolt Mass Sine 12/500 inverter. Input 12VDC, Output 230 VAC 50Hz. Currently the Mastervolt 12/2500 inverter charger runs off 120 V input from the generator or the 120 V shore power connection. The two Mastervolt Mass 12/80 and 12/60 chargers run off 240 input from the generator or the 240 volt 50-60 Hz shore power connection used for example in New Zealand or Europe. The W100 Westerbeke main engine has two alternators, Bosch 85 amp BXU 1285 (2002) and a Prestolite Leece Neville 90amp (2010). A Balmar Max Charge 512 Smart Regulator is installed. A 120V shore power connection provides 30/50 amp service with a 50ft cord, a 25ft extension and several dockside adapters. A 75ft 240V cord enables connection through the installed 240V inlet. Stainless steel cradle for six person RFD liferaft with automatic release. Service and Inspection 05/16. Next inspection 05/18. Sea Recovery 600 SRC 35 gal per hour watermaker. Continually maintained and upgraded including new membranes, high pressure pump, control panel etc. Detailed maintenance records available. Fresh water rinse for membranes. High pressure pump rewired to 220 volt. Maxwell 3500 anchor windlass with remote cockpit and foredeck control and spare motor.